Pallets and Singer oh my! I built this table using an old Singer Treadle sewing machine base and reclaimed pallet wood. After dismantling the pallet I Ran the boards through a planer to clean them up. After selecting wood some from my recovered stock I did dowel and glue joins for the table top and a re-enforcing back frame out of more pallet wood. The top was then run through the surface planer a couple more times then I ran the edges through the router table. Sanded it down to 320. Then add 12 layers or so of wipe on poly. I did a heavy coat of brush poly to the underside. Just add 4 machine screws and an old singer treadle base and Presto! a table for our upper landing. -- Don Riney, Arlington TX, --- Using a lathe involves breaking years and years of training and sticking a sharp piece of metal into rotating machinery. Great looking piece, cats thinks everything is theirs. Both nice tables Don and Sue. I’ve built 3 treadle tables to date. I still have about 5 more bases. I came across them and bought them as a bulk package. Maybe my next one I’ll actually have a picture of to post. 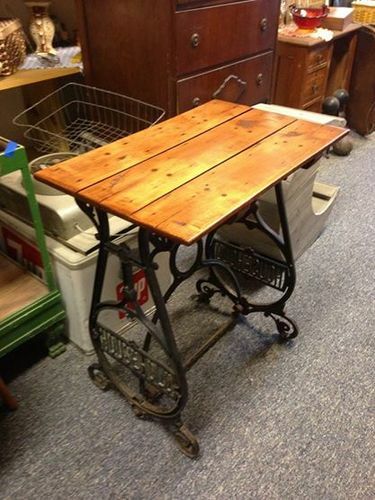 I really like the look of treadle tables.